DNA methylation, a process by which the DNA bases are modified by methyl groups, plays a vital role in gene expression and cell differentiation. It is essential for the development of multicellular organisms and directs a number of key processes such as genomic imprinting and repression of transposable elements. While the average DNA methylation level among a group of cells has been extensively studied, the cell-to-cell heterogeneity in DNA methylation, which reflects the differentiation of epigenetic status among cells, remains less investigated. Recently, researchers from QIAN Wenfeng’s Lab at the Institute of Genetics and Developmental Biology, Chinese Academy of Sciences, established a gold standard of the cell-to-cell heterogeneity in DNA methylation based on single-cell bisulfite sequencing data. They then asked if this gold standard can be recapitulated from bulk bisulfite sequencing data. To this end, they optimized a bulk BS-seq data-based computational pipeline for estimating the heterogeneity in DNA methylation. They further built HeteroMeth, a database for searching, browsing, visualizing, and downloading the data for heterogeneity in DNA methylation for a total of 141 samples in humans, mice, Arabidopsis, and rice. They illustrated the power of HeteroMeth in the identification of unique features in DNA methylation with examples. 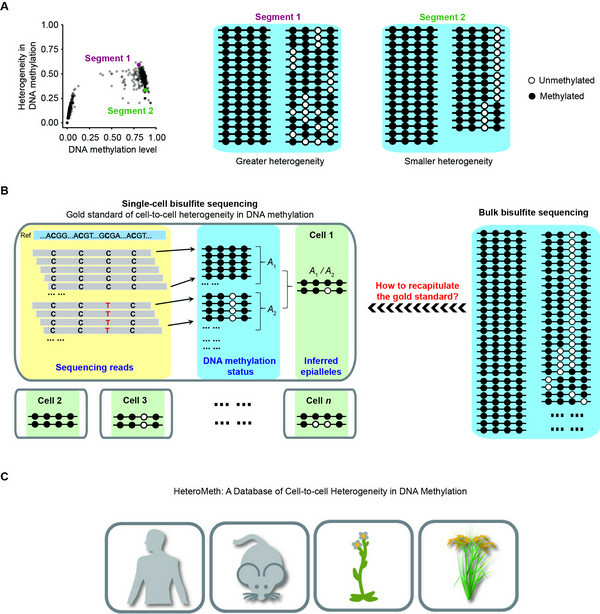 The optimization of the computational approach and the construction of the database in this study complement the recent experimental attempts on single-cell DNA methylomes and will facilitate the understanding of epigenetic mechanisms underlying cell differentiation and embryonic development. HeteroMeth is publicly available at http://qianlab.genetics.ac.cn/HeteroMeth. This work entitled “HeteroMeth: A Database of Cell-to-cell Heterogeneity in DNA Methylation”, has been published on Genomics, Proteomics & Bioinformatics (DOI: 10.1016/j.gpb.2018.07.002). This work was supported by Chinese Academy of Sciences.